Let’s Go Pikachu and Let’s Go Eevee are real, and coming to the Switch on November 16, Nintendo announced this evening, confirming previous leaks and rumors. These games will take players all the way back to Kanto region to collect the original 151 Pokémon, and they’ll feel very different than any Pokémon game we’ve seen. They’ll even have multiplayer. Inspired by Pokémon Yellow, where series mascot Pikachu followed around the player character, Let’s Go Pikachu and Let’s Go Eevee will take place in Kanto, the region from the original Pokémon games for the Game Boy, and will feature the original 151 Pokémon. In each respective version of the game you’ll have either Pikachu or Eevee sitting on your player character’s shoulder or head. While these games are the first proper Pokémon games to come to the Switch, Nintendo also announced today that there is a “core” Pokémon game in development for the console, slated to come late 2019. Update - 10:15pm: The game will also feature a brand new Pokémon, and some Pokémon from the Alola region. Nintendo will also be releasing a Poké Ball-shaped controller called the Poké Ball Plus for Let’s Go Pikachu and Eevee. Players will able to use that controller to “bring one of their Pokémon with them as they explore the real world,” The Pokémon Company International said today in a press release. Let’s Go Pikachu and Eevee appear to be inspired by the mega-popular mobile game Pokémon Go, which became a cultural phenomenon when it launched in 2016. Players will use a single Joy Con’s motion controls to catch Pokémon by gesturing at the screen to throw a Poké Ball, similar to the way you catch Pokémon in Pokémon Go. Pokémon will also be displayed visibly on the map, so players will be able to choose which Pokémon they want to battle, rather than facing them in random encounters. 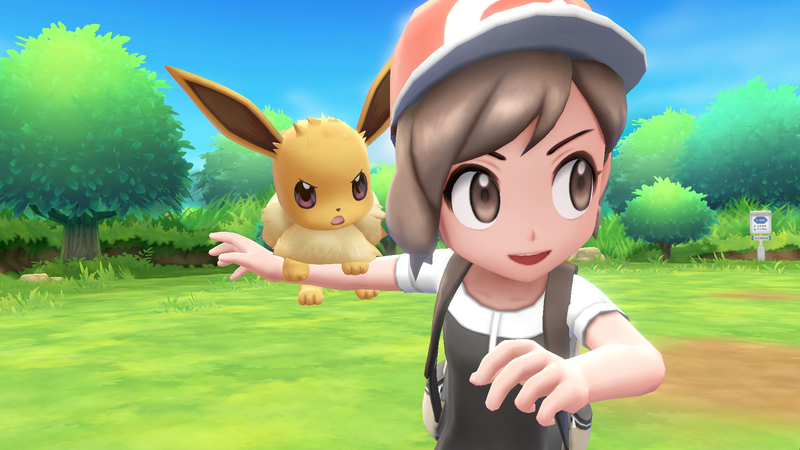 Players will also be able to transfer any of the original 151 Pokémon from their Pokémon Go game to Let’s Go Pikachu or Eevee by using a bluetooth connection.